You are what you wheat! Eliminate your wheat belly by going on a gluten free diet! 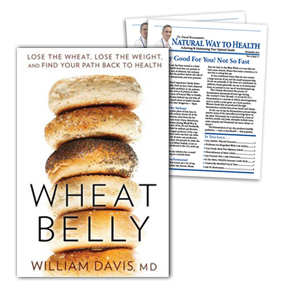 In Wheat Belly, cardiologist Dr. William Davis explains it's not excess fat intake or too little exercise that is making us fat. He says the culprit is today's genetically engineered wheat — and the agribusiness that pushes it on us in every aisle of the grocery store — and your only defense is a gluten-free diet. In fact, Davis reached the disturbing conclusion that wheat is the single largest contributor to the nationwide obesity epidemic. Drawing on decades of clinical studies and extensive gluten-free diet research, Davis observed that wheat can cause a broad spectrum of health problems including cancer, diabetes, heart issues, dementia, digestive complications, aging, acne, and even wrinkles. A gluten-free diet is also essential for those suffering from celiac disease, a potentially deadly condition. Celiac disease is an affliction that damages the lining of the small intestine and prevents it from absorbing certain healthy parts of food. The damage is due to a reaction caused by foods containing gluten, such as wheat, rye, barley, and possibly oats. Although celiac disease is incurable, its negative impacts can be prevented by maintaining a life-long gluten-free diet. Studies show that millions of Americans suffer from celiac disease — and they don't even know it. Early celiac disease diagnosis and the implementation of a gluten-free diet are imperative to avoid irreparable damage. In Wheat Belly, readers will also discover how people can also have other medical problems, besides celiac disease, when they eat wheat and related gluten proteins. Davis came to his conclusions about gluten's dangers, and the revelation that a gluten-free diet was the answer, after working with heart patients for years. He has helped thousands eliminate wheat, regain their health, implement a gluten-free diet, and shed those extra pounds. He can help you too, with practical advice, gluten-free diet tips, and wheat-free recipes for breakfast through dessert.